Reverse engineering or decompiling an application can be done easily for .net java applications and is very straight forward but for languages like C++ or C, it's not a straightforward process. The managed code (.NET and Java) world provides a much easier approach, as all source code is compiled into Microsoft Intermediate Language (MSIL). The MSIL is converted to machine code by a just-in-time (JIT) compiler when it is executed. 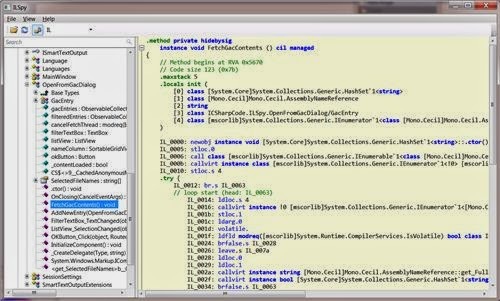 ILSpy requires the .NET Framework 4.0.
dotPeek is a free-of-charge .NET decompiler from JetBrains, the makers of ReSharper and more developer productivity tools. Supports .NET 2, 3.5, 4, 4.5, 4.5.1, WinRT Metadata, C#5, APPX and WinMD. 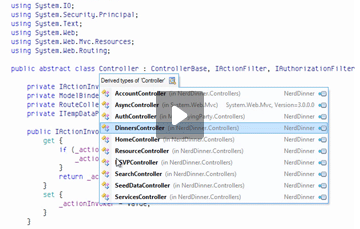 Decompile referenced assemblies in a Visual Studio project. Dotnet IL Editor (DILE) lets you disassemble and debug .NET code. dotPeek :dotPeek is a free-of-charge .NET decompiler from JetBrains, the makers of ReSharper and more developer productivity tools. ILSpy is an open source assembly browser and decompiler. MSIL Disassembler: The MSIL Disassembler is a companion tool to the MSIL Assembler (Ilasm.exe). Ildasm.exe takes a portable executable (PE) file that contains Microsoft intermediate language (MSIL) code and creates a text file suitable as input to Ilasm.exe. : ILSpy is the open-source .NET assembly browser and decompiler from the SharpDevelop team. .NET Reflector: NET Reflector is a commercial assembly browser for the Microsoft .NET platform that can be used to explore, analyze, decompile, and debug the contents of any .NET assembly. Used to be free. Dotnet IL Editor (a disassembler): Dotnet IL Editor (DILE) allows disassembling and debugging .NET 1.0/1.1/2.0/3.0/3.5 applications without source code or .pdb files. It can debug even itself or the assemblies of the .NET Framework on IL level. IL.View – IL.View is an open-source Silverlight .NET assembly browser and decompiler. Common Compiler Infrastructure (CCI): CCI consists of two components, CCI Metadata and CCI Code, which represent a .NET portable executable (PE) or debug file as an object model. Applications can then use the object model to analyze or modify the contents of the file. Assembly Analyzer: Assembly Analyzer is a tool for analyzing the metadata and resources within a .NET assembly, as well as disassembling non-CLI executable files. The tool allows you to view dependencies of assemblies and members. It uses the Mirror library (source included) for loading assembly metadata and other Portable Executable-format files. Salamander: Salamander is a commercial .NET decompiler that converts executable files (.EXE or .DLL) from Intermediate Language (IL, MSIL, CIL) binary format to high-level source codes, such as C#, managed C++, Visual Basic.NET, etc. For more than 8,000 classes that have been tested, Salamander always produces equivalent and recompilable codes that are remarkably close to the original source codes Dis#: commercial. Dis# (DisSharp) is a powerful tool to reverse engineer MSIL code into a human readable one. Spices.NET Decompiler: Spices.Net Decompiler is a commercial tool that offers a productivity package for .NET software developers that is exceptional in the industry for ease of use and top of the range performance. Decompiler.NET: Decompiler.NET is a commercially available combination of Decompiler, Obfuscator, Language Translator, and Refactoring Tool for Microsoft .NET managed applications.